This creamy, velvety soup brings together the classic combination of brie and fresh apples. 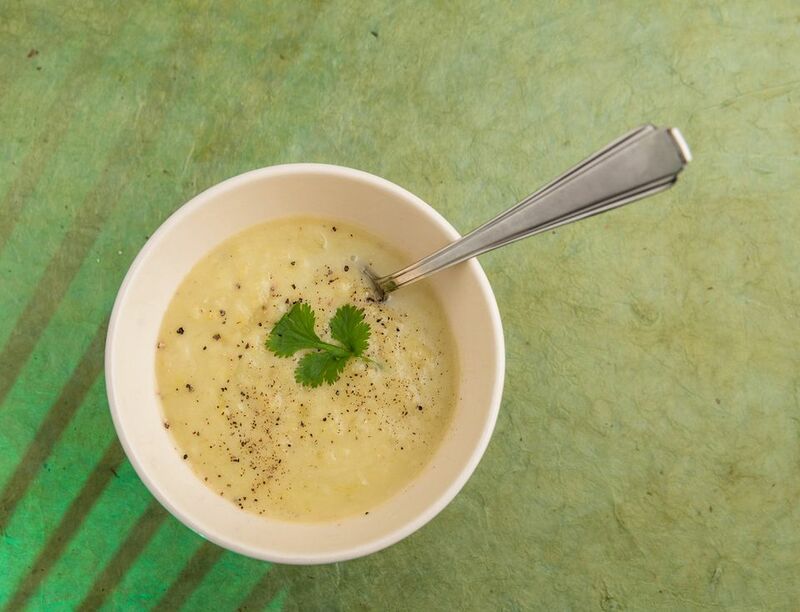 The cheese creates a wonderful savory and sharp flavor to soup while bringing a very nice creamy texture. Apples and spice lend an interesting depth of flavor. This will become everyone's favorite comfort soup. A delightful starter to any meal, the addition of bread makes this soup into a meal itself. Add the onions, apples, and celery. Saute until soft (about 8 to 10 minutes). Add the flour to make a roux (this is what will thicken the soup) and continue to cook for another 2 minutes. Pour in the chicken stock or water while continuing to whisk the mixture. Add the white pepper, cumin, and ginger. Bring to a boil. Reduce temperature to a simmer and continue to cook for 15 minutes. Remove the mixture from heat and puree in a blender or food processor. Return the pureed mixture to the pot and bring back to a medium temperature. Add the cheese cubes. After the cheese has melted, mix well. Just before serving, whisk in the heavy cream, and sprinkle on chives and nutmeg.